I was wondering if there was a simple way to add limits to values operators can enter in operator variables? So far what I am doing is having an if loop right after the operator variable assignment. But I was wondering if there is something that could be more neat! I'll suggest you program your loop in a script file as a new function. Placing this script file in the beginning of your UR program will allow you to use your own function everywhere in a neat way. 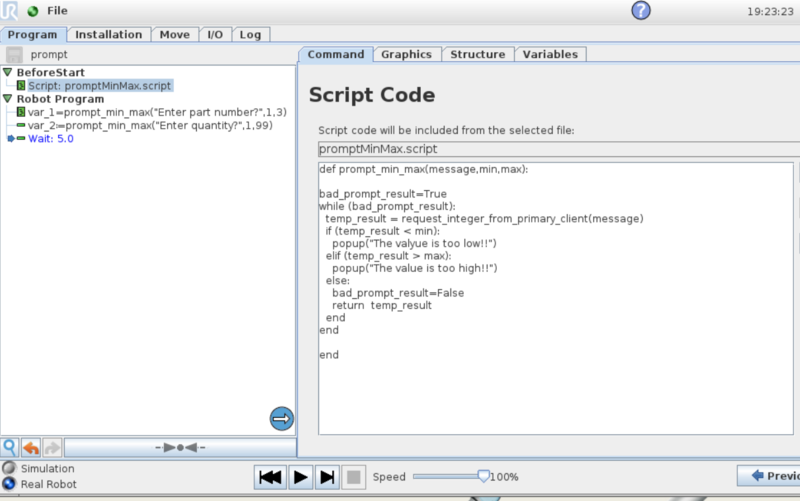 As an example, I've programmed a new min/max prompt function in a script file. Then I simply use this new function anywhere I need it in the program. This new operator prompt function is made for an integer but you can do the same for a floating point variable. By changing the function request_integer_from_primary_client with request_float_from_primary_client. Is it something like this you're looking for? @louis_bergeron This is a great idea, will have to keep this in my back pocket.